Lines Fiction: With your movie clip NOW we expand the field of presentations on Lines Fiction – in a broad sense it is about the moving image and your practice of transferring the idea of motion into your drawings: For your video you animate the ants to sit on specific places, and you follow their traces in your drawings. Katharina Meldner: In the movie the ants represent lines and dots of a drawing. In my drawings they are present through my following their traces with the pen. In a single shot of 29 minutes (full length original) the movie shows the emergence and disappearance of the writing now in an unstable, and continuously changing configuration of a group of ants: On a piece of paper I wrote the word now with sugared water which became invisible after drying like sympathetic ink. I put the paper between two highly frequented on-ramps of the Berlin highway. The ants that came and discovered the invisible sugar crystals were forming the word now in a highly unstable form. During this process a lot of forms and possible wordings emerge, only twice one can read the word now before it disappeares immediately. This visual instability is in contrast with the audible homogeneity of the traffic on the highway. 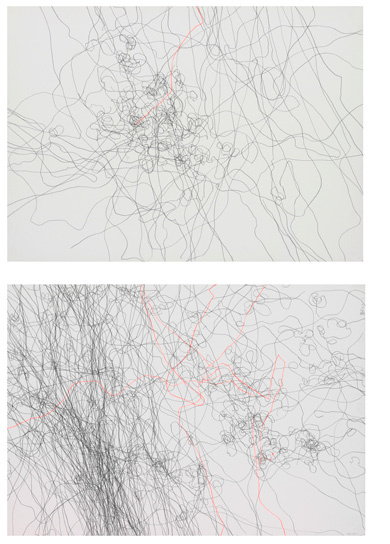 The film belongs to the series of drawings Routes of the Ants that I started in 1980, and that documents the behavior of several ant populations. I followed the trace of each ant on the piece of paper with a pen. 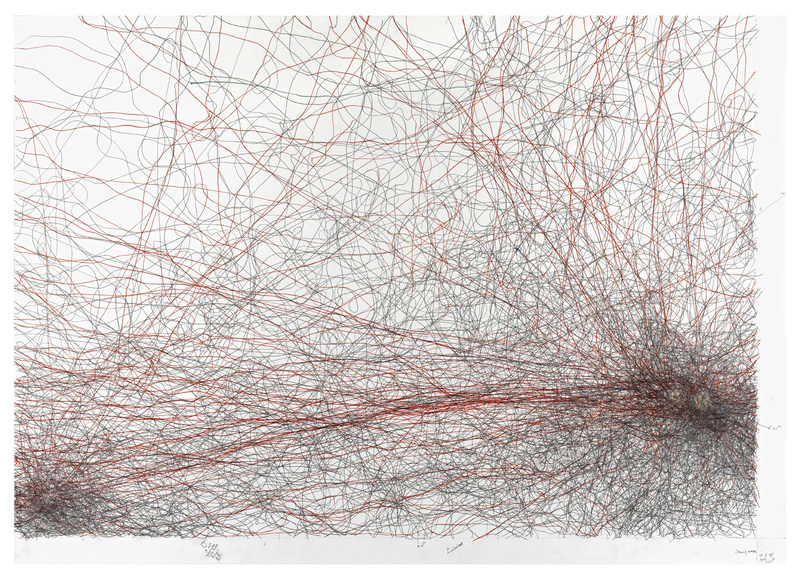 For the ways of search and exploration I used a pencil, and the paths an ant took to carry their prey I retraced in red. The ants lead my hand. There is an change of initiative. Even more so in my new drawings of wood ants’ traces. From the placement of food on the paper together with the activity of the ants, and the duration of the process, emerges the structure of the drawing. I see the result as a partial view of an imaginary drawing in which the lines continue over the paper’s edges into the ants’ nest. And because my drawing hand could not follow all ants, the existing drawing represents an imaginary work that contains all of the untraced ways of the ants, spanning the whole terrain of the population. 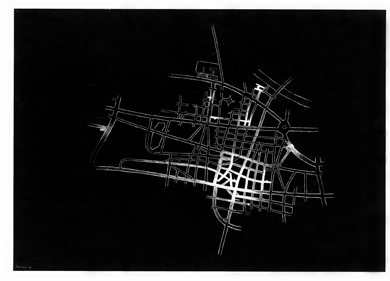 Lines Fiction: Looking at your manifold work, I link your drawings of ground views displaying nightly cities from your series Stadtkarten (city maps) with the drawings of ants’ paths. 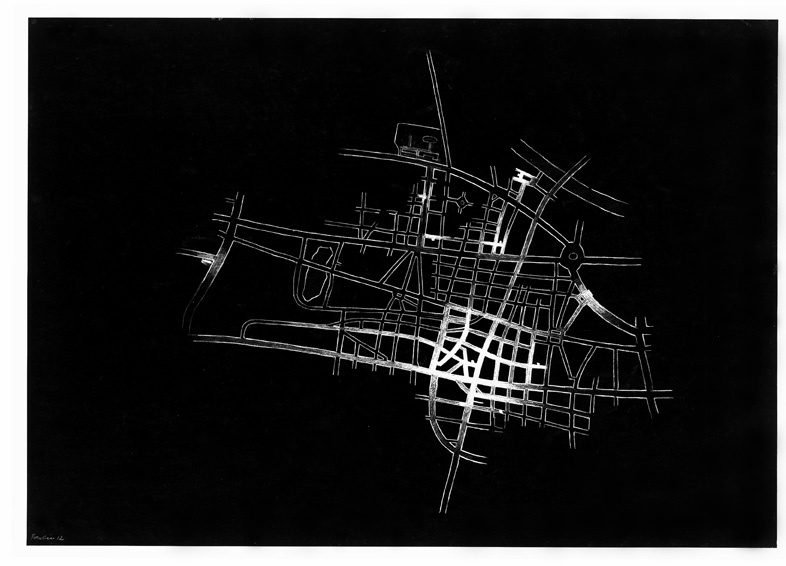 This series evolved between 1980 and 1990, and the highlighted empty streets on a black background seem to me like a dark side contrasting your lively drawings of ants’ paths. Am I right with my association? Katharina Meldner: There is such an aspect. In this series the black color represents the unknown or the forgotten. But even the drawings of ants’ paths tend to turn into a black surface. There are some drawings from 1982 I worked on for four hours a day for seven days, turning the individual walks of the ants into a black surface of graphite , making them invisible. Around the same time I started with my series Stadtkarten in 1980, during a longer stay for a grant in Olevano/Italy. These ground views are mapped from memory, showing cities and places where I lived or stayed for a while since my childhood. I tried to transform the memory of being in the town into some sort of a cartographic structure being above the place. The intensity of the white color represents the intensity of me recalling certain streets and areas. These drawings were always done when I was not in place. There is a complete other subjective mapping imaginable. This absence of consistency fascinates me in both series, the ants’ drawings and the city views. In both cases, the series aim towards the possibility of a comprehensive imaginary drawing from which my actual drawing finally emerges as a singular and subjective result.